Ever since humans arrived in the Grand Valley, the paleontological resources of this area have fascinated their minds. Soon after the area was settled in the 1880s, paleontologists began arriving to investigate the mysteries of ancient life captured in the rocks. Paleontologists continue their research even today at the Museums of Western Colorado, as well as other institutions around the world, who are still unlocking the clues to the past, with new technology and new hypotheses. Discover the beginning of our paleontological story below. The first peoples in Mesa County to notice and collect fossils were the various aboriginal inhabitants. Native Indians manufactured some of their chipped stone tools from agatized dinosaur and mammal bone, and agatized wood. Trade beads containing segments of fossils were worn for adornment. In an 1899 letter to Elmer S. Riggs of the Chicago Field Museum, local dentist Dr. S.M. Bradbury stated that dinosaur bones had been known in this region since 1885 and collected as curios. In 1891, a local newspaper documented the discovery of “agatized bones of the mastadon (sic)” contending that nearby was a cave with eight mummified bodies of the genus Homo 11 feet tall. Such local legends and misidentifications abounded; it was not until 1900 when the first scientific work was conducted in the county. Riggs collected a forelimb and shoulder blade of Camarasaurus near the Colorado National Monument; he also uncovered the first, or type specimen of Brachiosaurus at Riggs Hill on the Redlands. Returning in 1901, he uncovered two-thirds of an Apatosaurus (Brontosaurus) at Dinosaur Hill near Fruita. These specimens were taken to Chicago to be exhibited in the Field Museum, where they were a sensation. On his way to collect dinosaurs at Dinosaur National Monument in 1909, Earl Douglass stopped in Mesa County to make the first scientific collection from the Plateau Valley’s DeBeque Formation (also known as Wasatch Formation) beds. In 1913 he returned to collect more extensively. During 1923, Junius Henderson of the University of Colorado Museum collected in both the Green River and DeBeque Formations of the county. That year, Roy Moodie published a book on paleo pathology in which he described a broken and rehealed rib from Riggs’ Apatosaurus find. By 1929, more local people had been involved with making scientific discoveries. Al Look began making finds in both the Morrison and DeBeque Formations of the county and Ed Faber found his first partial skeleton of Barylambda faberi, a large, hog-size mammal that roamed in groups about 50 million years ago in the Plateau Valley area. These discoveries inspired Bryan Patterson of the Chicago Field Museum to begin his study of the Plateau Valley area. 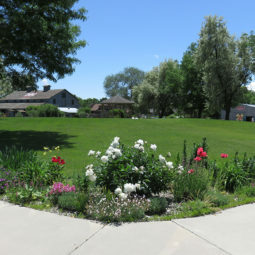 Staying at the Harris ranch in Plateau Canyon, Patterson carried on his field collecting intermittently from 1932 to 1947. During the 1935 visit, Faber found a Uintathere tooth and Look found the skull of one of Barylambda faberi‘s cousins, Sparactolambda looki. Patterson returned in 1937, collecting many skeletons including the Sparactolambda looki, Haplolambda quinni, Bathyopsoides harrisorum, and Probathyopsis newbilli. That year, Lee Edward Holt began collecting for his University of Colorado Master’s thesis in the Grand Valley’s Morrison Formation. A local collector, Ed Hansen, found Stegosaurus tail vertebrae at Riggs Hill, leading Holt to uncover a Stegosaurus, Allosaurus, and perhaps another Brachiosaurus. In 1938 Riggs returned to the Grand Valley for dedication ceremonies at both Riggs and Dinosaur Hills. Paid for by Look, Riggs, and the Grand Junction Chamber of Commerce, a bronze plaque commemorating Riggs’ early discoveries was erected at each locality. Look, Holt and others attempted to acquire and protect the second Riggs Hill quarry as an in-situ exhibit, but the bones were stolen by souvenir hunters. Patterson returned to Mesa County for his fifth field season in 1939, working there again in 1940 and 1941. His final field season was in 1947. Ivan Kladder, a Grand Junction lawyer, made finds in both the Morrison and DeBeque Formations. He systematically collected in several localities, most of which he discovered, later donating this scientifically important collection to the Museum of Western Colorado. The Douglas Pass area (although in Garfield County, Grand Junction BLM district) yielded many important fossils during the 1950s. Many new species of insect larvae, ants, and bees were found, including the three oldest known butterflies. Bird feathers, bird tracks, and fossil leaves were also found at several localities on the northern border of Garfield County. Finds in the Green River, DeBeque, and Morrison Formations continued in the 1960s, but generally were not associated with museum or university expeditions. In 1968 Jim Jensen of Brigham Young University excavated a Camarasaurus at the Dominguez-Jones Quarry (originally discovered by Ed and Vivian Jones of Delta). In 1972, the first expedition began to the Jones family location of Dry Mesa Quarry above the Escalante River. There Jensen found many bones of a diverse fauna including the huge meat-eating Torvosarus and the great Supersaurus. In 1979 he found the even greater Ultrasaurus. Near Fruita in the early 1970s, there were two independent finds. Gerry Stuart found a jaw of a primitive lizard-like sphenodontids – extremely rare and scientifically important. Dr. Robert Young reported a set of small meat-eating dinosaur footprints near the same area. 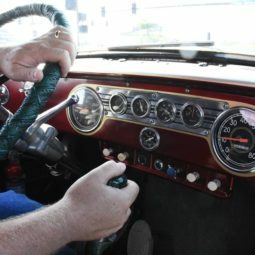 The region was further explored in 1975 by Dr. George Callison and his crew from California State University at Long Beach. They uncovered small, yet well-preserved, remains of turtles, crocodiles (later named Fruitachampsa callisoni), other sphenodontids, small adult dinosaurs (including the smallest known adult dinosaur), a pterosaur, and five families of the oldest known mammals in the Western hemisphere (older ones have since been found in Arizona). At the same time nearby, Lance Eriksen of the Museum of Western Colorado found a partial skull of Allosaurus with teeth (vandalized before he had a chance to remove it), and in 1976 his son Thor found a tibia of the meat-eater Ceratosaurus nasicornis – the skull and partial skeleton proved to be the second, largest and best preserved, therefore of enormous scientific value. Because of these extremely important finds, the Grand Junction District Office of the Bureau of Land Management (BLM) sponsored a meeting attended by land managers and paleontologists of international stature. Due largely to the efforts of Callison, Eriksen, John Crouch, Beverly Goodrich, Peter Robinson, George Gaylord Simpson, and others, this area was set aside as the Fruita Paleontological Area. Callison conducted a paleontological resources survey of Colorado National Monument in 1977. He and his crew noted 12 dinosaur-producing localities on the Monument, but little else is known of these fossils. In 1979, Eriksen studied a set of dinosaur tracks in Cactus Park, determining that two types of carnivorous dinosaurs had left their footprints in the area. 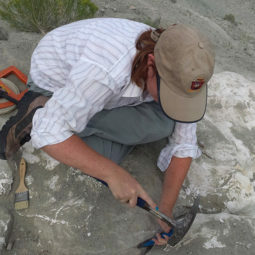 Working at the Bookcliffs, he also uncovered parts of both a mosasaur and a plesiosaur. A theropod dinosaur femur and claw molds were found in a boulder of the Burro Canyon Formation near Whitewater. Allen J. Kihm began field work for his Ph.D. dissertation on the vertebrate fauna of the DeBeque Formation in 1976 through the University of Colorado at Boulder working many of Patterson’s and Kladder’s localities as well as finding a number of his own. Through his efforts, extant collections were further identified and systematized. Patterson revisited the area in 1977 to aid Kihm in pinpointing several localities. The BLM subsequently contracted for Kihm and Harley Armstrong to conduct a literature search and field survey for vertebrate fossils in the Grand Junction area; assessing the 21 then-known and two new localities of the Morrison and Burro Canyon Formations, they also addressed the paleontological potential of all geologic formations in the area. In 1981 Eriksen and the BLM’s Gloria Triplett found fossil remains of the oldest known fossil flowers in the world. Hundreds have now been found in the Burro Canyon Formation on the Uncompahgre Plateau. A new species of early mammal, Priacodon fruitaensis, was named after the important location (Fruita) of its discovery. March 18, 1981, Pete Mygatt and John D. Moore began work on an amazing discovery at Rabbit Valley, remains of a Camarasaurus, Allosaurus (numerous broken teeth), and a very large Apatosaurus in a mudstone layer. Digging at the quarry for the Museum of Western Colorado was discontinued when vandalism to two plaster-jacketed vertebrae was discovered in early 1983. To protect the unrecovered material, the BLM buried the site. During the 1970s and l980s, a great deal of paleontological work was conducted in the area, much of it by the local Museum of Western Colorado. Liz McReynolds, Area Geologist for the local BLM, discovered an important dinosaur find in 1982. Investigating an exposed Camarasaurus skeleton in a sandstone ledge at Rabbit Valley, she recovered five skull fragments containing parts of teeth from the talus in the drainage below the ledge. Nearby that year, Marjorie and Walter Averett were taking an afternoon walk when she spotted small shiny teeth. Tracing them uphill to the source, a partial skull in a sandstone boulder, Marjorie reported her find to the BLM’s Triplett, who in turn asked Grand River Institute’s Armstrong to verify the find. Verified and collected, it was tentatively identified as a plant-eating Camptosaurus. Over one hundred years of paleontological work in the area has produced many exotic, beautiful, and scientifically important fossils. As work continues on our paleontological heritage, the people of Mesa County and our neighboring friends can look forward to learning more about our past. Professional and amateur paleontologists know that Colorado contains some of the richest geological formations where dinosaur bones of all shapes and sizes have been found and reported! From Dinosaur National Monument in the northwestern corner of the state (and eastern Utah) to the towns of Morrison and Canon City on the eastern slope, Colorado fossil beds have yielded an amazing assortment of dinosaurs. These have included the type find for Brachiosaurus, Stegosaurus (the official state dinosaur) and Ultrasaurus, one of the largest dinosaurs that ever lived. What makes Colorado one of the best places to find dinosaurs? During the Jurassic, 206-144 million years ago, the region was home to inland seas, large lakes, swamps, streams, creeks, and lots of dinosaurs. Deposits of shale and sandstone were laid down, and as dinosaurs died, their bodies were sometimes quickly covered. These geological strata are known collectively as the Morrison Formation, found throughout many parts of the state. The Morrison Formation in eastern Utah and western Colorado is home to the dinosaur fossils in the “Dinosaur Diamond.” In Colorado the Dinosaur Diamond stretches from Dinosaur National Monument in the north and spreads south to the Uncompahgre Plateau near in Fruita. Our dinosaur fossils can be found in museums throughout the United States. In 1900 Elmer S. Riggs of the Field Columbian Museum, Chicago, collected the type find for Brachiosaurus at Riggs Hill in the Redlands. A year later he unearthed an Apatosaurus from Dinosaur Hill near Fruita. In 1979 Jim Jensen of Brigham Young University, Utah, excavated one of the largest dinosaurs yet discovered, Ultrasaurus in Mesa County near Delta, Colorado. J.D. Moore and Pete Mygatt began work on several dinosaurs at what is now the Rabbit Valley Natural Area in 1981, and Harold Bollan discovered Stegosaurus nearby. Some of the smallest dinosaurs yet known have been unearthed in the Fruita Paleontological Research Natural Area by Dr. George Callison, formerly of California State University at Long Beach. 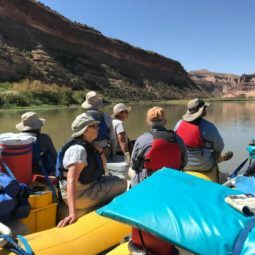 Today, the Museum of Western Colorado works closely with other institutions, the Bureau of Land Management, and private land owners to carry on this work in western Colorado and eastern Utah. In 1900 Elmer Riggs, from what is now known as the Field Museum of Natural History in Chicago (in Riggs’ day it was the Field Columbian Museum), discovered the bones of a 70 foot long, 30 ton Apatosaurus at Dinosaur Hill. He returned in 1901 with a crew and removed what turned out to be a major part of this dinosaur. Riggs transported the skeleton to Chicago where it has been on exhibit since 1908. In 1991 and 1992 local paleontologists with mining crews reentered and expanded the mine on the southeastern side of Dinosaur Hill. They found tools used by Riggs’ crew and four Apatosaurus bones (three tail chevrons and a rib segment). The one mile scenic hiking trail goes past the location of the Apatosaurus collected in 1901. In 1900, Elmer Riggs, a paleontologist at Chicago’s Field Columbian Museum, set out to the Grand Valley to collect dinosaurs. Led here through correspondence from Dr. S.M. Bradbury of Grand Junction, Riggs was inspired by the news that ranchers had been collecting fossils in this area since it was first settled in the 1880s. On the south slope of this hill in rocks of the Jurassic-age Morrison Formation, Riggs and his field assistants discovered and excavated a previously unknown dinosaur. Riggs assigned the name of Brachiosaurus altithorax (deep-chest arm-lizard) because the front legs were much longer than those in the back and the ribs were nearly 9 feet long. In honor of Riggs’ discovery, this hill was named after him, and the site of his quarry is marked with a stone monument. The dinosaur specimen was discovered on July 4, 1900, but work on it did not begin until three weeks later because Riggs and his crew were finishing work at another site near what is now the east entrance to Colorado National Monument. Riggs recognized very quickly that what they had found was at the time the largest dinosaur known. It remained the largest known for 70 years. The crew took about six weeks to dig up the dinosaur, and by mid-September they were on their way back to Chicago. Brachiosaurus was a gigantic (43-ton) sauropod dinosaur distantly related to Apatosaurus (Brontosaurus). Unlike most sauropods, however, the front legs of Brachiosaurus were very long, its tail relatively short, its chest very deep, and its neck rather long as well. These characteristics and the fact that its teeth were those of a plant-eater suggest that Brachiosaurus was the Late Jurassic equivalent of a giraffe, feeding high in the treetops. Brachiosaurus is still one of the rarest dinosaurs in the Morrison Formation. In 1937 on the northwest slope of this hill, Edward Holt discovered partial skeletons of Allosaurus and Stegosaurus. Hoping the area would become a natural research center, Holt left the bones in the rock. Unfortunately, the bones and other scientific information have been lost through vandalism. Dinosaur bones are found all over the world, and they’re found in specific formations. What’s a formation? It’s a geologic layer of material such as sandstone, mudstone or silt that geologists and paleontologists use to identify the age and even the kind of climate and landscapes that existed when the formation was created. For example, in Western Colorado, dinosaur bones are found in the Morrison Formation. The Morrison Formation is made up of greenish- and reddish-colored shales and was deposited when this area was a large basin. Dinosaurs just loved to hang out around here because there were lots of rivers and trees – and that’s why there are so many bones just waiting to be dug up! On the Isle of Wight, off the coast of South England, rocks are yielding fossils from the early Cretaceous period — spanning from 100 million to 140 million years ago — which are rarely found elsewhere. The island is a window on the Cretaceous world which doesn’t occur anywhere else in the world. The island is important not only in historical terms, but also because new dinosaurs continue to be discovered there and are well-preserved and articulated — that is, their bones are joined together. A previously unknown cat-like, flesh-eating dinosaur was discovered in a crumbling cliff by an amateur fossil collector. And in 1997, another previously unknown dinosaur, Neovenator salerii, a smaller version of Tyrannosaurus rex, was found on the island. Did you know that Colorado is the Stegosaurus State? That’s right, the Stegosaurus is our official state fossil – in fact, many of the first dinosaur fossils were found right here in western Colorado! The first Stegosaurus ever found was collected from near Morrison, Colorado, just west of Denver. The giant sauropod dinosaur Supersaurus was collected from near Delta, in western Colorado. The oldest dinosaur body fossils in Colorado are from near Glenwood Springs and are approximately the same age as the ancient trees at Petrified Forest National Park in Arizona. Pseudo-dinosaur fact: Of sites producing pterosaurs (flying reptiles, not dinosaurs) in the Late Jurassic of the western U.S., almost half are in western Colorado. Tyrannosaurus rex and Triceratops have been found near Denver but not in western Colorado. Only older relatives of these two dinosaurs are found in western Colorado. A young duck-billed dinosaur was found in marine rocks in western Colorado — it had been washed out to sea (from what is now Utah) and sank to the bottom. Apatosaurus, a dinosaur found near Fruita and at several places in Rabbit Valley in western Colorado, probably weighed about as much as 150,069 Big Macs. Through most of dinosaur times, dinosaurs shared the world with smaller animals like frogs, salamanders, lizards, mammals, and turtles. The giant Supersaurus probably weighed about 92,400 pounds. Some adult dinosaurs from the Fruita Paleontological Area in western Colorado were smaller than a chicken.